Mid-Ohio Season Race Passes are on sale now for the 58th season of racing at the legendary road course in Lexington, Ohio. As announced last week, Mid-Ohio Sports Car Course will feature its largest and most diverse spectator schedule in 2019 with three additional event weekends added. The Mid-Ohio Season Race Pass is one of the most spectacular values in all of sports and available currently at an advance price of $325. This is the ultimate season ticket to see all the Mid-Ohio racing action, plus it offers exclusive fan access and benefits. During August’s NASCAR Xfinity Series event, the garage area is open only to Mid-Ohio Season Passholders at designated times. Paddock access is also an included benefit for The Honda Indy 200 at Mid-Ohio while it is complimentary to all spectators for the remaining six events. The season pass provides over $1,065 in value of tickets, coupons and redemption offers for use on site. It also includes access to other weekend car club and races not always open to the general public. The 2018 Season Race Passholders have the opportunity to renew or upgrade their previous grandstand seats and reserved Season Motorhome space location. The Mid-Ohio Season Race Pass ($360 regular price) is available to new purchasers now as well. The renewal customers’ window to secure the same grandstand seats and motorhome spaces as last race season closes on Monday, January 14 at 9 p.m. ET, when they will be released for public sale. All purchases can be made at midohio.com or by calling 419-884-4000 during business hours. Fans who go online to buy will also encounter an all new website launched atmidohio.com. It has an improved user experience, more fan information and easier navigation on all devices. Also, during the holiday season, gift certificates are available for purchase in various value increments to redeem for race tickets by the recipient as well as The Mid-Ohio School course-specific certificates at a holiday savings. Single event tickets will go on sale Wednesday, January 16 at 10 a.m. ET. “This will be the busiest schedule yet in Mid-Ohio Sports Car Course’s history. 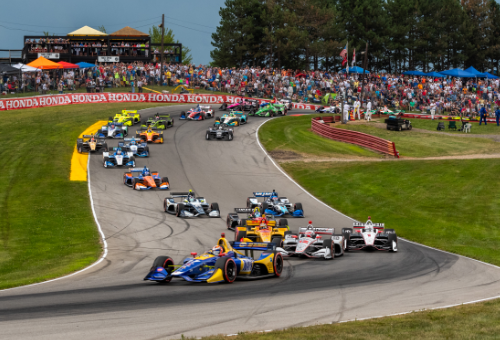 The Mid-Ohio Season Race Pass provides great access to experience all the action next season,” said Craig Rust, president of Mid-Ohio Sports Car Course. “We have eight events spanning five months and truly something for everyone in 2019. This season pass is a great value and right now is being offered at a special advance price during the holiday season!” Back by popular demand, the Mid-Ohio Rookie Racers program is available for purchase as well. This membership club, which offers the youngest fans (children aged five to 12 years) to engage with motorsports through unique at track experiences, enhances the family experience of attending events at Mid-Ohio Sports Car Course. The complete 2019 Mid-Ohio Sports Car Course schedule is as follows: Acura Sports Car Challenge (IMSA WeatherTech SportsCar Championship) – May 3-5Cooper Tires ARX of Mid-Ohio – June 8-9Vintage Grand Prix of Mid-Ohio – June 21-23AMA Vintage Motorcycle Days – July 5-7The Honda Indy 200 at Mid-Ohio (IndyCar Series event) – July 26-28NASCAR Xfinity Series event – August 9-10NASA Championships – September 18-22Cooper Tires ARX of Mid-Ohio – October 5-6 The Americas Rallycross (ARX) Championship comes to the Midwest for the first time, June 8-9, then returns for a second weekend, October 5-6, for a doubleheader of the Cooper Tires ARX of Mid-Ohio. The National Auto Sports Association (NASA) Championships Presented by Toyo Tires, September 18-22, returns to the 2.4-mile, 15-turn road course after a seven-year absence serving as a national championship event for nearly 500 amateur racers in over 20 race classes. The Acura Sports Car Challenge, featuring the IMSA WeatherTech SportsCar Championship, will be the Mid-Ohio season-opener for a second consecutive year in May. Additionally, the Vintage Grand Prix of Mid-Ohio and AMA Vintage Motorcycle Days follow on their traditional weekends in June and July, respectively. Then, Indy cars return in late July for the 35th time for Ohio’s largest motorsports event, The Honda Indy 200 at Mid-Ohio, followed by the NASCAR Xfinity Series back for a seventh straight year in early August. Mid-Ohio Sports Car Course offers one of the best family values in all of live sports and entertainment. Children 12 and under always receive free general admission when accompanied by a ticketed adult. Visit midohio.com or call 419-884-4000 for additional information. NEXT POST Next post: DARLINGTON RACEWAY RACE TICKETS MAKE GREAT GIFTS THIS HOLIDAY SEASON!